So you like to stay informed on topics that matter to you. You are an active and informed citizen; you always vote and enjoy discussing issues with your friends and family. But maybe you’ve been noticing lately that – with a few exceptions – most news media are no longer providing the quality of coverage that you expect. Stories are shorter, more homogenous, poorly researched and lacking context. You are sick of sports, weather and traffic and you find yourself regularly yelling at the TV. What’s a news consumer to do? You stop consuming news, is what you do. This is the conclusion from a study done by the Pew Research Center in the U.S. that looked at the reduction in staffing at media outlets and the consequences for news consumers (the study only covered the U.S., but the same trends are felt here in Canada). A more visual summary of the study can be found here. One of the study’s most alarming findings is how the decline in quality news coverage is affecting public awareness and debate on public policy and issues. If a newsroom can’t afford to examine or question the pronouncements of politicians, corporations and interest groups, then news consumers will not get any value from the news they consume and instead just go directly to the source. Those who are abandoning media outlets are the typical heavy news consumers: more educated, more affluent and more involved – the type of people that form a part of the foundation of public debate and engagement. The result? Our public discourse is further impoverished. This ties back to my last post, which discussed the critical role public broadcasters can play in informing and engaging the public. Some suggest that this view is just wrong; there has never been more content available to consumers and it has never been easier to access. I’m not sure if I share this opinion – for me the key question is whether I can get objective news on stories that are important to me from a source I trust, and not from opinionated blogs like this one. Interestingly, the report suggests the news media have been poor at explaining newsroom budget cuts to their customers, and at linking those cuts to the quality and quantity of news. The study concludes that even those consumers who understand that newsroom cuts lead to poor news coverage are fleeing the ship. I would bet they mostly flee to alternative information sources that reflect their opinions back at them. Or, they are getting more information directly from organizations and corporations through social media. Have newsrooms missed the story? Have they forgotten to communicate some basic context to their audience? Yes, they have. But it would seem as the worst type of self-indulgence – and I say this as a former journalist – to tell your audience that your budget got cut and now you have to close some foreign bureaus and rely more on wire copy. As a news consumer, would you appreciate that? I’m a strong supporter of public broadcasting. If done right, and adequately funded, public broadcasting can inform, engage and reflect a country back to its citizens. There is no doubt that better-informed citizens make better-informed decisions about everything from public policy and voting to financial and lifestyle choices. Good public broadcasting helps both citizens and the rest of the news media to hold governments to account. You only have to look south of border to see the impact a weak public broadcaster has on the quality of public knowledge and political debate. So I was quite interested in a recent article in the Globe and Mail about a study done to measure citizens’ knowledge of current affairs in six countries with strong public broadcasters. Canada, despite what you may think about the CBC, is one of the six countries. The study’s general finding is that public broadcasters have a positive impact on public knowledge. So we can expect the Harper government – which prefers Canadians fearful and ignorant – to continue to cut funding to the CBC. The result will likely be the continued erosion in quality journalism and programming (overdone news coverage of the new pope, the cringeworthy Jack Layton biopic and the continuing presence of Don Cherry and Kevin O’Leary being a few examples) at the public broadcaster, particularly for English TV. Well, at least we have CBC radio. I should also single out TVO for the quality of its current affairs programming. The next post will further explore what happens when news consumers don’t like what’s on offer – from public or private broadcasters. I have yet to read, hear or see any reasonable justification of why I am subject to a barrage of news coverage on the new pope. 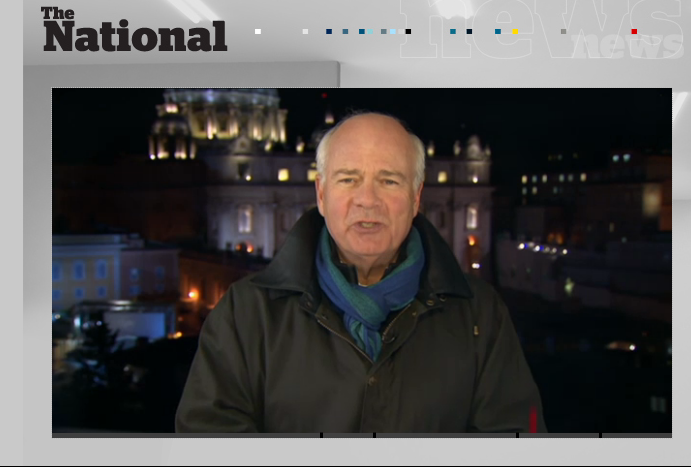 Of particular concern to me is the CBC, and the National (full disclosure: I worked for the National for several years as a writer), which has sent Peter Mansbridge to Rome. Why is the CBC spending newsgathering money hosting the top of the show from the Vatican? I can see the private broadcasters decamping to Rome, but this reflexive blanket coverage – “CBC News was first on the scene with coverage of this historical event!” – has no place at the public broadcaster. At the very least, host it from Toronto and save your limited budget for a real news event. Breathless accounts of the conclave, the machinations of backroom negotiations and the devout assembled at Vatican are not relevant to me as a viewer. I could not care at all whether the guy from Quebec threw his support to the South American delegation. I am not remotely interested in vague speculation on whether the new pope will suddenly transform the Catholic Church into a service organization for the world’s poor. The media village at the Vatican? Not a story. Tell me why the new pope is important to me. Tell me why it should matter to me. Tell me what you know about the new pope or what he will do that is relevant or different from past popes – without speculating. If not, please move on and get to some real news. When thinking about how to tell a story visually, television journalists will always look to b-roll. B-Roll describes those general visuals that are] used to support the storytelling, but that are not clips of people talking, a reporter’s on-camera standup or graphics. That shot of a giant dump truck driving through the oil sands in a story about gas prices? That’s b-roll. An interview subject walking into his office and typing into a computer? That’s b-roll. Back shots of obese people walking down the sidewalk to illustrate a story on junk food? Also b-roll. Here’s an example; One time when I worked as a television producer, I was once at Pearson airport doing an interview for a story about Canadian Olympic athletes on their way to the Sydney Games, when a huge storm blew over the airport. The cameraman and I both thought shots of the storm (black clouds, pelting rain, lightning) would be great b-roll for future stories on airport weather/delayed flights/angry passengers/etc. But getting good b-roll is always a challenge. Some of it is shot specifically for each story (like the walking shot described above), but there is almost always a need to get b-roll from the video library. Networks have libraries filled with b-roll on almost every conceivable topic – but the trick is in finding the right shots that will be perfect for the story.Some companies hand out b-roll to journalists, but there is a clear preference for non-corporate or non-institutional b-roll — as corporate b-roll frequently looks too polished and doesn’t really fit in well with the rest of the story.